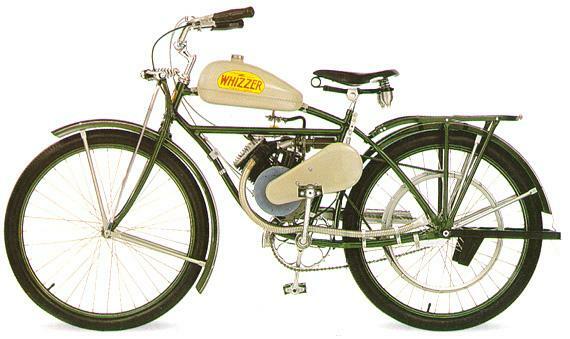 history of the Whizzer, the most significant motorized bicycle ever built. bicycles (anybody have one for sale, call me!). 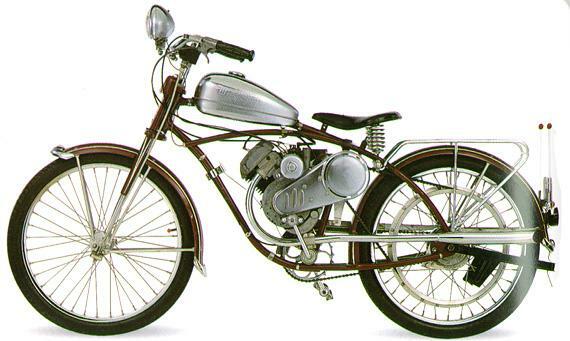 and launched their bicycle engine in late 1939, the Whizzer Model D.
wall... just don't try to ride it! Note: Quick! Name the only vehicle you could buy new during WW2... WHIZZER! significant improvement of being belt driven. later models were installed in preassembled bikes at best). 'restored' you get the restorer's idea of nostalgia. SPECIAL (Schwinn DX frame by Whizzer, built until about 1963). model) until about 1952 and sold through their extensive dealership network. utilizing frames quite different than anything seen in the U.S. Sales begin to fall off dramatically in late 1952. * Bimatic transmission proves a costly failure and is discontinued. Company begins production of aluminum windows and kitchen utensils. parts from across series which blurrs model lines. back in the early 70's). Various prototypes and one-off models are extant in many series. brings $1,100-1,400 in today's market. shape and $1,500-2,000 as a barner. Maybe $2,800-3,000 in running order and $2,000 next to a tractor. gernerator is spendy and should have the headlamp and a complete drum brake. The absolute best bet for both rideability and appreciation! $3,500-4,000 running and $2,500 in the shed. look very similar. These should be avoided like the plague. all have to wait n' see! Thoughts, gripes, comments? email me!